Good morning readers! 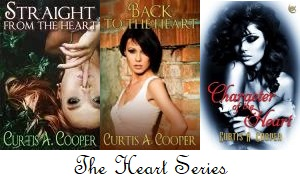 Today, I am pleased to be interviewing my friend and fellow eXtasy Books author, Curtis A. Cooper, who wrote the Heart Series. The third book in the trilogy, "Character of the Heart" was released on January 11, 2019, and it looks like it's an amazing read. 1. Who are your influences as an author? CC: First, I want to thank you for your interest in me, VJ. I don’t get the chance to open up too often. As for my influences? I don’t think I have an influence, per se. When I started writing, I planned on one book. I developed a story line and started writing. I talked the conversation parts through my head as though I was listening to the conversation. I guess I’ve seen enough movies that dialogue sounds choppy. I never wanted mine to be like that. I needed to make sure they flowed smoothly. And because of the story I chose to write, it made me learn the value of research. I liked taking what I learned and putting it all together like an elaborate puzzle. 2. Have you ever done a search on Google for yourself as an author? CC: Definitely. I wanted to see where I was located on the internet and how I was able to be found. CC: A lot of my characters are names of my family. I did one book sort of alphabetically like first name A and last name Z. Well, not Z. But close to the end. Mainly, I just pull them out of the air. That can make for issues on its own. And thank goodness for editing. Once I finished a book of mine, I printed the whole thing out and went from start to finish editing. Half-way through, I found I’d changed the name of one of my characters. 4. How long does it take for you to write the first draft of a book on average? CC: That’s hard to put a good number to, the way I write. I would say it takes roughly a week for me to write a chapter. But then I type it, print it, edit it, and then send it off to my writer’s group for their chance to find errors and make recommendations. So, it takes me roughly 8 months to write a novel using those steps. 5. Which area of writing do you think you could improve the most? CC: Scenery details. No one does dialogue better than me, but mentioning surroundings definitely needs improvement. 6. What do you consider the easiest aspect of writing for you? CC: I really don’t find anything easy, to be honest. And now that I’ve taken up romance as my main genre, it’s that much harder. I know there are lots of people that think romance is Harlequin rubbish. But I’m here to tell you, romance is one of the toughest genres. You can’t shoot through the sky in your rocket or evade the latest monster to evolve in romance. Yes, those aspects could be in the romance novel, but having a creature come at you is much easier to write than having to strip your characters down to their raw emotions and make them not only human, but believable. 7. Which author would you like to write your biography? CC: I can’t say I would want my biography written, to be honest. I’ve had a colorful life, but I would leave much out as I thought about who would be reading it. 8. Would you ever write someone's biography? If so, whose? CC: I’ve never really wanted to attempt non-fiction. Granted, some of those who have biographies written are excellent examples of fiction. 9. What was your inspiration for writing the Heart series? CC: I was writing my fourth book and got bogged down in what some might consider writer’s block, but in reality, there were barriers placed in front of me that took longer to get around at times. One night, I’d thought of an idea for a “what if” love story about 2 characters that should be so different that they could not come together. I talked to a friend about it and came up with a few other challenges that would fit the scenario. Suddenly, I was flooded with ideas and it didn’t take me long to drop the novel I was working on and start this story. Straight from the Heart was born. When I got back reviews on the story, some of those reviews prompted me to write a second. I wrote the third because I didn’t believe a series was only 2 stories. Incidentally, all the titles of my Heart series have double meanings in them. 10. Why did you choose romance, instead of another genre? CC: I’d say I didn’t choose romance. It chose me. I told myself way back, that I would never write in this genre. Now, I have three novels, two short stories, two novels with romantic overtones, and I’m working on a mystery/romance. I believe the feeling I got from readers of my first true romance won me over. Even with the subject matter I chose, I didn’t lose any readers. I gained several, though. Thank you for your time, VJ. If you or any of your audience wishes to see my works, I can be found at http://curtisacooper.com Thank you all for your time. THANK YOU for being here, Curtis! I hope to have you again in the future!